Governor Satya Pal Malik said on Thursday that terrorism severely and adversely hampered the growth and development of the youth. “We want to kill terrorism and not terrorists,” he said. 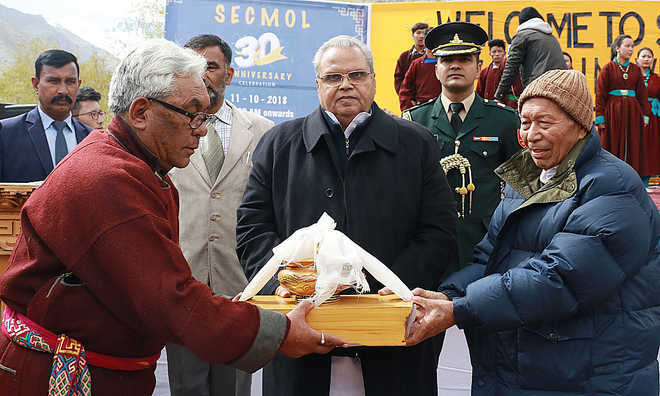 He issued the statement while presiding over the 30th anniversary celebration of Students' Educational and Cultural Movement of Ladakh (SECMOL), founded by Sonam Wangchuck, in Phey, Leh. He was accompanied by Advisers BB Vyas, K Vijay Kumar, Khurshid Ahmad Ganai; BVR Subrahmanyam, Chief Secretary; and Umang Narula, principal secretary to the Governor. Appreciating the efforts of the Students’ Educational and Cultural Movement of Ladakh in providing education and life skills to the students, the Governor said, “Empowerment comes with education and people who give priority to education ensure a bright future to the nation by taking it on the path of development." The Governor appreciated Wangchuk for his commitment and conviction in taking up challenges and lauded his endeavours in keeping youth connected to their roots. He said his team was making efforts to build trust among the youth by offering a positive platform for dialogue. He asserted that the youth of Kashmir had great potential to excel in sports and the state authorities were coming up with international stadiums in the Valley to promote their talent.